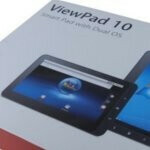 There are some aspects of the ViewSonic ViewPad 10 that we adore, namely its truly affordable cost as a decent Windows 7 tablet, but what makes the experience sour is the fact that it sports the super outdated Android 1.6 experience. Adding to the misery is the fact that the Android experience is truly marred by a bunch of things, like its confusing set of Android buttons, but thankfully it’s getting its fair share of love. Specifically, the dual-boot tablet is getting its tasting of Android 2.2 Froyo, which provides plenty of new and recent features that should make it a more tolerable Android tablet. However, there’s no mention if it’ll be getting any official Flash 10.2 support, but then again, Internet Explorer on the Windows 7 side is a true desktop web browser. Unfortunately, getting Froyo onto the tablet isn’t as easy as you’d expect, especially when most things nowadays go through the usual over-the-air process. Instead, you’ll have to read the instructions provided in the PDF file, then load an image of the Android 2.2 install on some sort of flash media, and finally get access to the BIOS to install the new firmware. Once all of that is squared away, you can breathe a sigh of relief that it’s no longer sporting an aged Android experience.